I’ve had the privilege of photographing more than a few people down through the years, but rarely have I had someone with such an outstanding combination of attractiveness, personality, and accomplishment, as I have found in Lee. She recently graduated with honors from Oklahoma University, and her mother asked me to create portraits of her before she moved on into the next phase of her life. And an adventurous life that will be! After a season of travel and study in Washington, D.C., she will be serving in Malawi as a Fulbright Scholar, researching farming practices and the impact of hybrid seeds. 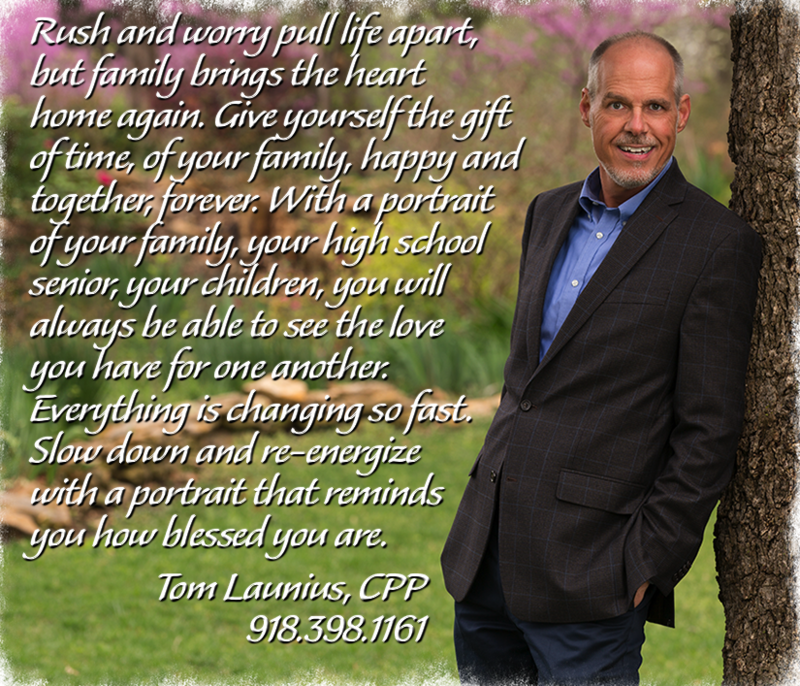 Having never before had the honor of photographing a Fulbright Scholar, I found Lee to be a totally delightful, engaging person, bright and personable as we enjoyed a beautiful evening portrait session at my outdoor portrait studio in Claremore, Oklahoma. When Lee and her mother saw the results of the portrait session, they were thrilled! One of the images even ended up in an article about Lee written in the Tulsa World. I’m proud to have taken Lee’s portraits, and I wish her well in all that she has to look forward to in life. In the olden days (translated: “up until the last few years”), senior portraits were only for high school seniors. But nowadays, that fun experience has moved back a few years. Now, more and more often, the so-called “tweenager”, someone who is 10, 11, or 12 years old, is getting in on the action: multiple outfit changes, multiple locations, multiple poses, major fun. Maddie, in the portrait above, is just one of many tweenagers in the Tulsa area whose portrait I’ve taken recently. And–guess what?–they are fun! The boy or girl has the best time, and the pictures turn out great. 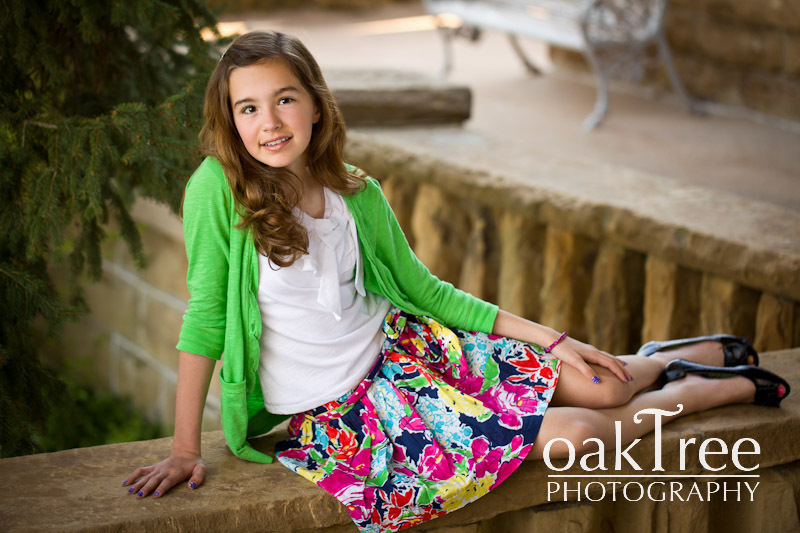 A tweenager portrait session is a great time in life to get some extraordinary portraits made. You don’t need me to tell you, but professional photographers are a strange breed. We share nearly everything with our colleagues, we support each other and watch each other’s back, we hang out and enjoy each other…but when it comes to our locations for outdoor portraits, we are ruthless. We never reveal our amazing locations. The senior portrait image you see to the right was taken of Tyler, in Tulsa, Oklahoma, but that’s all I’m going to say. I’m not going to give away the location. But it’s amazing. I love the natural light, I love the strong lines created by the buildings. I love how conveniently located it is in Tulsa. And, most of all, I love the fact that none of my colleagues know about it. I know, I know, I shouldn’t gloat. But I love having special locations that no one else knows about. Of course everyone takes portraits at Woodward Park (I don’t, I think it’s way over used.) And everyone takes portraits at the Gilcrease Museum (I do, in fact, it’s one of my favorite places.) But to have special places that no one knows about, well, just say I’m driven to go off the beaten path if I think it will reward me with a unique location. Tyler certainly benefited. Who knows, maybe you will, too. And now for something completely useless: a flower! A hyacinth, to be exact. Why is this hyacinth useless? Because, by posting it on my blog, I’m not going to generate anymore clients for my photography business. Nor is the image itself going to be purchased by anyone. And the time spent writing this blog entry for you is not going to pay off in any measurable sort of way. And yet. And yet to be useless is to be valuable. For example, this hyacinth grows in my own front yard, at the foot of the mailbox, where I planted its bulb last fall. I rejoiced as its first little tip emerged from the ground, and I’ve watched it grow since then. As the first bloom opened, I began to see the potential for a photograph. So, I began to check the flower multiple times each day, watching its progress, gauging how the weather would affect it, trying to estimate when the bloom in the background and the buds in the foreground would each be at their peak. Then, when that moment arrived, I threw my morning schedule out the window, spent the better part of an hour sprawled on my stomach to get just the right angle, set up diffusers and flashes and a host of other photography paraphernalia, and recorded the image which now is on display in this post. Is it the most spectacular flower portrait you have ever seen? Not hardly. But it was a joy to anticipate its creation. And I trust that it will be a joy for you to look at it for yourself. As a fringe benefit for me, by spending so much time up close with the hyacinth, I got to fall under the spell of its heady fragrance. How delicate! How exotic! Now if only there was a way to convey the aroma in a photograph…now that would be something! 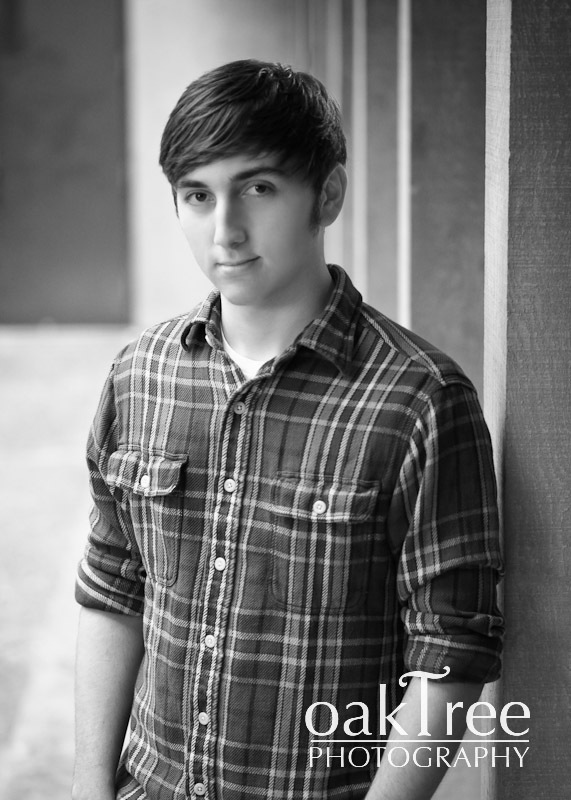 For senior photography, the “urban look” has been around for a while, so much so that it’s almost a cliché. Still, it’s a lot of fun. No senior portrait session is complete these days without at least one jaunt down an alleyway to find some grunge backgrounds and edgy light. Most of my urban photography is done in Tulsa, Oklahoma, but here is a portrait taken in Claremore, just off the backside of downtown. And, the young man isn’t even a high school senior, he’s a “tweenager” named Nathan. His Aeropostale t-shirt, the black door, the debris all around, the casual pose, the relaxed expression on his face, the fashion style of natural lighting, all of it works together to make one fine “urban look” portrait. To be honest, portraits like these are usually not Mom’s favorites. But trust me, young people today eat these up: these are the images they want to put on their Facebook page!